I love brownies. 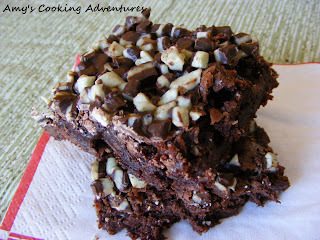 In fact, I love brownies from the box because they are so fudgy and delicious. I could try making them from scratch, but why mess with perfection, right? So I was thinking about those Peppermint Brownies I made around Christmas and was lamenting a bit because Candy Cane Kisses are only sold at Christmastime. Boo. I was dreaming of something as decadent and luxurious as those as I walked the candy aisle when I came across the Andes Mints. So I picked them up with dreams of minty brownie goodness and continued my shopping trip. Then, I came across Andes mints baking chips in the baking aisle! Even better since now I wouldn’t have to chop up the candies. After I made these, I was immediately in love! My husband, however, was a harder sell. In his own words, he likes “pure unadulterated brownies” and considers nuts in brownies to be blasphemous. Yet even he, the brownie purist, loved these brownies. So go. Make some brownies. With all this snow and yuck, you deserve it. Preheat oven to 350, or as directed on the brownie box. Spray a 9x13 inch pan with non stick spray, set aside. Mix brownies, as directed. Fold in the chocolate chips. Pour into the pan and bake as directed until a toothpick inserted in the center comes out clean. Immediately after removing brownies from the oven, sprinkle the Andes mints oven the brownies. The heat from the brownies will melt the chips. Cool completely. OMG! You continue to astonish me with delicious recipes. Love it! Yummy! I have to say that I LOVE recipes that start with a mix and then add to it! So much easier than starting from scratch! I'm with you, I love brownies from a box! 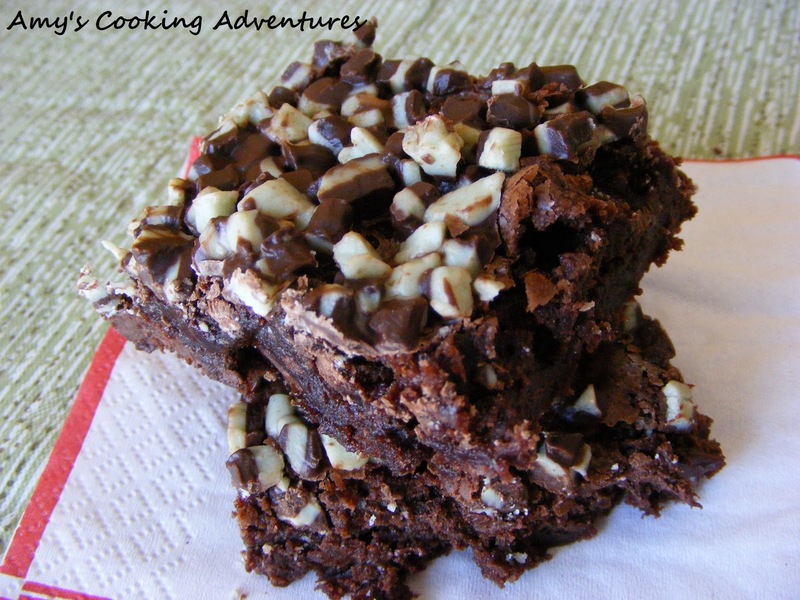 In only a few minutes you have delicious brownies, what's wrong with that? And I love how you dressed them up. Mint is the perfect pairing. 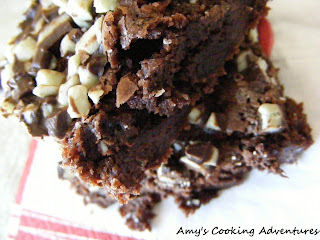 I am all about brownies from a box. They are just so good. Mint & chocolate is the most divine pairing - YUM. Thank you, I ate waaaaay too many of these! Haha!